For the benefit of the readers, we will now start classifying Media lies as “Big lies” and “Miscellaenous Lies”. “Big Lies” would ordinarily include those lies which impacted public discourse to a large extent. The email did not say anything about Fadnavis asking to be deboarded or delaying the flight. Eventually co-passengers of Fadnavis used twitter to support him and lay out the facts. They said Fadnavis was busy quietly reading a file and did not ask to be deboarded even once. Later Fadnavis too tweeted the same and promised legal action. Entire MSM was spreading the news that Maharashtra Government had derecognized Madrassas and would not consider them as schools. This was being played up deliberately to give it a communal angle. The fact is, the Maharshtra Government had decided that ““A child, male or female, if found studying only in religious institute which does not take government grant and does not follow formal school syllabus, will be considered uneducated and out-of-school,” as announced by Dilip Kamble, Social Justice Minister. This meant that students studying in any religious institute, be it madrassa or vedic school, would be called out of school. The decision was for all schools not teaching subjects like maths and science, but only religious subjects. However MSM reported it as if only Madrassas were affected. We had a detailed post on this. Following the furore of Kejriwal’s alleged high electricity bills, TNIE decided to use some half cooked facts to show Kejriwal in better light. Firstly, TNIE claimed that Narendra Modi’s bill was of Rs 21 lakhs, but did not provide a shred of evidence to back this claim. Further, they presented electricity bills of a range of politicians, from Jaitley, to Sachin Pilot, to Rahul Gandhi, and showed how their bills “ran into lakhs of rupees”. They put up screenshots of the bills, where the total bill amount was shown, but did not put the breakup of that amount. This is important because Most of these bills which ran into lakhs, were made up of arrears of several months. If the arrears are removed, then the bill amounts for the latest month ranged from Rs 7,788 in Uma Bharti’s case to a maximum of Rs 33,471 in Jaitley’s case, both of which are much lower or comparable to Kejriwal’s bill. As the title suggests, PTI reported that PM Modi would host an Iftar party in Srinagar. No source was mentioned for this story. On the very next day, PTI itself had a report contradicting itself. Now they claimed that PM Modi has no plans to hold an Iftar Party as per “Highly-placed sources who refuted reports”. This was an amazing case where a fake “source based” story was run and then reversed by the same agency. Media was trying to link each and every unnatural death in Madhya Pradesh to the VYAPAM scam, as long as even a slight link to VYAPAM was proved. We had written separately on this here. It is important to understand that VYAPAM runs ALL professional and Government admissions in MP via exams. Hence it is highly illogical to link everybody who got through VYAPAM, to the scam. Yet, when a trainee cop, who was like thousands of others recruited via VYAPAM, committed suicide, MSM quickly added this to VYAPAM death count. Eventually NDTV reporter Gargi Rawat and some news reports clarified that the cop was mentally stressed and her death was due to other “personal reasons”. In a similar case, the death of a constable was again linked to VYAPAM, and again, Rawat clarified that his death was due to other reasons. There were 2 more deaths in recent times which were highlighted by media as “VYAPAM deaths”, which were, as at the time of writing this, not conclusively linked to VYAPAM by doctors or police. We had done a separate detailed post on this. After confirmation from multiple sources such as other news reports, and even cross verifying with the audio and video tapes of Amit Shah’s speech, it was clear that Times of India had invented this entire clickbait headline and Amit Shah had never said such a thing. In fact Shah never once mentioned “acche din” in his speech. He had said that inflation, unemployment, poverty can be eliminated in 5 years, but for India to become Vishwaguru, BJP would have to win every election from Panchayat to Parliament in the next 25 years. 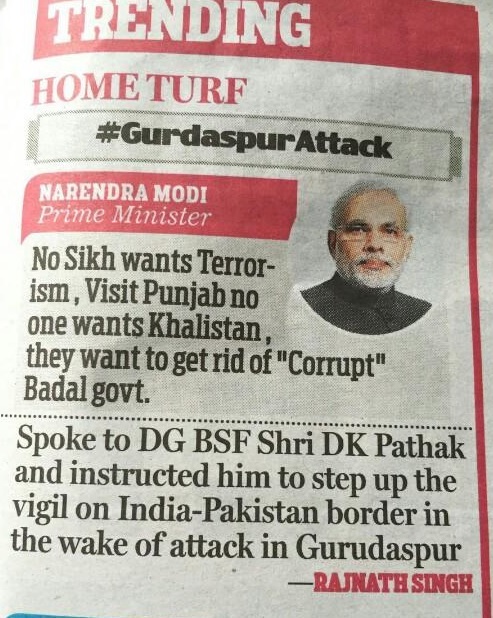 Times of India had blatantly lied and was exposed after the recordings of the speech were out. This was originally a lie from February 2015, and even though there was enough evidence at that point itself to say it was a lie, in July, the police found conclusive evidence and nailed the culprits. We have added a Times of India story link as an example. On 14 July, the cops caught a 19 year old boy in connection with this “vandalisation” which was in fact only a case of theft. The boy had previously stolen from his own school too. The cops caught him based on his fingerprints and the CCTV footage. There was no vandalisation nor any communal angle to this case. After being severely embarassed on Social Media, NDTV changed the above article, but you can get a hint about the old article from the URL and this screenshot. The scale of lies can be imagined when the headline changes from that, to “River is safe, no Sewage”. 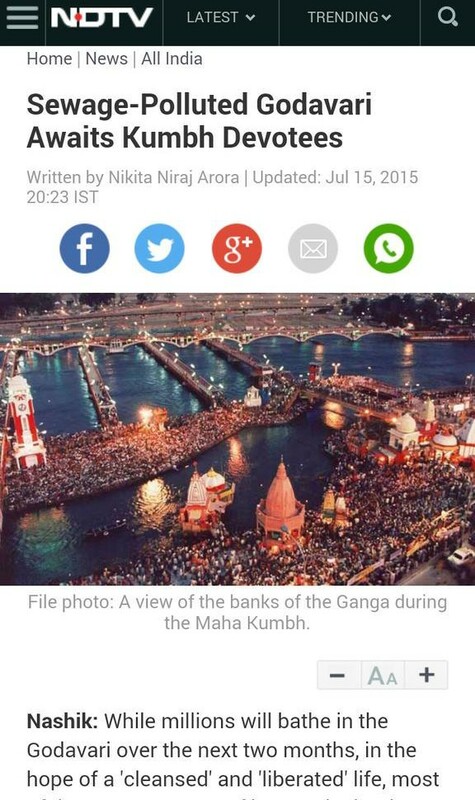 First, NDTV used a pic of Haridwar Ghat, as seen in screenshot, and claimed it was a pic of Godavari. Secondly, NDTV claimed that the Nashik collector and an NGO had told them that the river was polluted. This was vehemently refuted by the Municipal Commissiner of Nashik Praveen Gedam, after he personally talked to both people. He also demanded that NDTV release the audio tapes of the conversation. Later, Sonia Singh from NDTV jumped in, and after much dilly-dallying accepted that they had reported the claim made by an NGO, as a fact, and apologised for this. And all of Praveen Gedam’s claims can easily be proven, by having a look at his tweets much prior to this story. He has regularly been uploading pictures of the cleanliness work going on. And this is the final proof, of how NDTV spun this story. This portion of her piece was circulated by many Adarsh Liberal journalists as a damaging proof of how Fadnavis is careless. After 3 days, the Public Relations department of Fadnavis, forced Economic Times to apologize for this lie. They showed that details of all the meetings attended by Fadnavis were evident from his social media account and can also be verified from the Consul General of India. Economic Times, on their part, posted a small apology, but not before the damage was done. We had written a separate post on this detailing all the places where NDTV via Sreenivasan Jain maliciously edited Ramdev’s interview and twisted his statements. Jain deliberately omitted the parts where Ramdev proves his credentials to help in the Unnat Bharat programme. Further, Jain showed Baba Ramdev’s reply to his question on the alleged scams of BJP, as the reply to Jain’s question on running of the Modi Government. Ramdev had expressed satisfaction of the running of the Modi Government but Jain deliberately deleted this answer and pasted the other answer here. Further he also said that financial burden could also be a reason for suicides. Similar replies were also given in the past, since all ministers were only reading out the statistical data. We had written a separate post on this. Factchecker.in claimed that they had debunked various claims made by the Power Ministry, but a closer examination revealed that in most cases, goal-posts were shifted and in some cases basic facts were not verified. Business Standard was one of the sites which had published this. Once they were apprised of the numerous errors, they withdrew the article and published an apology. Factchecker.in though did not seem to back down. They gave further explanations to their post, which in fact made it even more clearer that in reality they had not disputed the Power Ministry claims, but had only added some more arguments to suit their bias. However, they did later modify the headline and dropped the “false claims” portion, thus in effect admitting that they had got it wrong. This is a rare case where no-one can verify what the truth is. The New Indian Express claimed that ““I accept my guilt. May Allah forgive me” were Memon’s last words, and printed this on their front page in bold. However a far more detailed report on Mid-day claimed the exact opposite. They said Memon kept saying “Main begunah hoon (I am innocent). This is injustice” and at no stage accepted his guilt. Obviously one of them is wrong but there will never be a way to find out which one of them was wrong. By cleverly laying around with words, Indian Express tried to show that Rahul Gandhi had filed a Writ Petition on de-decriminalization of defamation. The report said, “The court is hearing a clutch of petitions filed separately by political leaders like Rahul Gandhi, Subramanian Swamy and Arvind Kejriwal,”. With Rahul Gandhi’s name at the forefront, one would assume he is the leader of this cause, but in fact Subramanian Swamy was the first to file this writ petition, with others like Rahul Gandhi and Arvind Kejriwal, impleading. This was clarified by Swamy via a tweet. Times of India printed this as a quote of Bobby Jindal in all their editions. 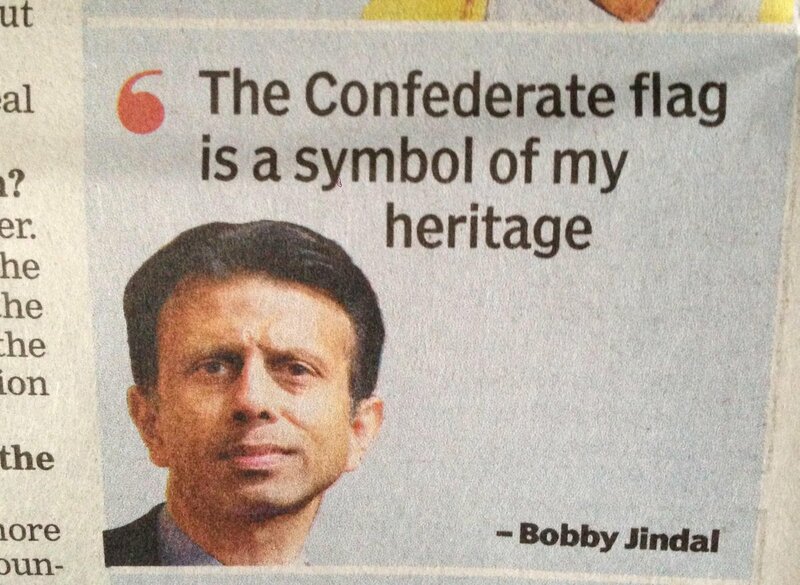 Actually Bobby Jindal never said such a thing. Times of India got this quote from a story on a site which publishes only fake news under satire. Finally the Twitter handle of the IAS Association tweeted back to Times Now handle claiming that the story was baseless and that they should check their facts. @TimesNow Pl check facts. It’s a baseless illogical story. @tinucherian @TOIDelhi @pradeepToI @toi_BhartiJ Illogical story. As many officers would have sought central postings & tenure extensions! Soon another IAS officer joined the chorus and claimed that they were having “fun” and the Times of India story was “dumb”. The “Lies” portion here would be the touting of this story as a “Breaking and Exclusive” by NDTV and Barkha Dutt. Dutt, repeatedly tweeted that she had accessed some tax reports from 2013 which proved Sudhir Sharma, who was involved in VYAPAM, had financed BJP. And this, she claimed was a “Breaking & Exclusive” story. Fact is, this story was broken by Indian Express a whole year before Barkha even noticed it. Such unnecessary hyping of an old story served only to sensationalize a piece of evidence which was already public and in all probability, also examined by the probe team. 5. 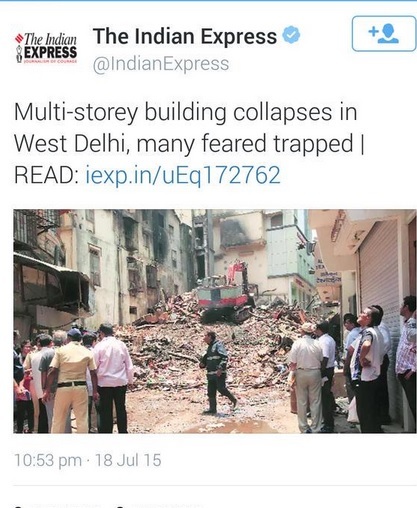 18 July 2015: Indian Express – Using File photo for a current tragedy of a collapsed building in Delhi. on 18 July, according the screenshot attached above, Indian Express tweeted at 10.53pm, about a building which had collapsed in West Delhi, at around 9pm on the same day. In the tweet, they included a pic of collapsed builidng, but the pic was taken in broad daylight. This made it clear that they had used a stock image to portray a breaking incident, thereby misleading readers about the intensity of the incident. After being rebuked by journalist Shiv Aroor, the tweet was deleted. 6. 18 July 2015: NewsX – Claiming a pic from a Pakistani rally is a pic from a protest in Kashmir. Outlook made the above claim, and then proceeded to attack the “Gujarat Model”, Debroy, and the Government over this stance. Outraged by this false news, Debroy tweeted out the facts. He firstly clarified that Millennium Development Goals (MDGs) are not of UNICEF. And secondly, he was talking about Sustainable Development Goals (SDGs), which are set to replace MDGs soon. From the above its clear that Yoga has been added to the physical activities and any of these activities must be done for at least 2 periods every week, and not only Yoga. “If you want to leave footprints in the sands of time, don’t drag your feet”, originally said by Arnot Sheppard, attributed to Dr Kalam. “if you want to shine like sun first you have to burn like it”, a quote of Hitler. Both the sites eventually removed the above quotes after being educated by readers. On being asked by a twitter user Editor of India Today Shiv Aroor checked with Mr Gill and confirmed that Mr Gill had in fact referred to ISI and not ISIS and that the Times of India interview was misquoting him. The false portion in this news piece is the “mentally challenged” portion. Times of India uses a sensational headline and claims BJP says those opposed to SC verdict are “mentally challenged”. In the body of the article though, statements of BJP national secretary Shrikant Sharma. national spokesperson Nalin Kohli and of spokesman Sambit Patra are given in quotes. The words “mentally challenged” do not appear in any of the quoted statements of these three people. Yet Times of India has imagined that at least one of them has said it and hence manipulated the headline.